Instruction in basic baseball skills will be covered such as: throwing, catching, base running and batting. This is a great way to prepare for the upcoming baseball season. Bring your glove. Practices may begin by May 15, 2019 upon the discretion of each volunteer coach. Games begin June 3, 2019. Instruction will continue throughout the program. Please bring a glove. Volunteer Coaches are Needed: If you have an interest in helping kids learn baseball, and can spare a few hours a week, go to www.ZionParkDistrict.com to print a volunteer application. Turn in application by May 6, 2019. A meeting for the parents who would like to coach/assist a team will be held at 6:00 pm on Wed., May 8 at the Hermon Park Community Center, 2700 29th Street. One day training camp Sat., April 13, 2019, at Diamond #3 behind the Leisure Center. In case of inclement weather we will be inside the Sports Arena Gym, 2400 Dowie Memorial Drive. Please bring a glove. Time to be determined. Little League Baseball is a great experience for boys and girls, ages 6 thru 12. This program is run with a strong emphasis on fun and participation. We want kids to enjoy the game and to be part of the fun that comes with playing baseball. Players will be notified by April 17th, 2019 by their coach or the Park District to let them know what team they are on. Practices may begin April 24. Games begin May 20, 2019. Most teams play 10-12 games. All Coaches must complete a volunteer application and be interviewed. Attendance at two coaching clinics, set up by the Zion Park District, is required. Coaches please note: Help is needed at the training camp on Saturday, April 13, 2019. There also will be a coaches training session that all coaches will need to attend in order to coach (date and times to be announced). If you have an interest in umpiring this summer, call the park district at 847-746-5500. Umpires and officials are needed for Little League and Pony League. Attention: A certified umpire means more pay per game!!! This program is for youth, ages 13-14. Game days and times may vary due to diamond availability. We play teams in Beach Park, Winthrop Harbor, Waukegan, and North Chicago. We play each team twice and there are playoff games at the end of the season. Please bring a glove. A copy of a birth certificate is required at time of registration. Coaches are needed! *As of Aug. 1st of the current year. Evaluations and uniform fitting dates will be held in April, dates and times to be announced. Games may begin May 20, 2019. This class is for the younger dancer new to dance. Basic movement skills and rhythm, along with some basic tumbling will be taught. Ballet, tap and jazz dance steps taught in this class will allow your child to express themselves through creative movement. Basic movement skills and rhythm, along with some basic tumbling will be taught to enhance fine and gross motor skills, cultivate imagination, creativity and social development in a caring environment. Tap shoes are provided. Our dance program is designed to emphasize basic dance fundamentals, rhythm and movement. Kids will learn listening skills along with boosting their self-esteem. This class will include tap, jazz, ballet steps and dance routines. Dance attire or comfortable clothing may be worn. Bring your tap shoes if desired, not required. Instructor will provide additional information on the first day of class. We have condensed a Youth Fitness program into a 4-week session with a Certified Personal Trainer. This program gives kids and teens the knowledge and skills to develop age-appropriate exercises in a fun, positive atmosphere. This class improves their overall health by building endurance and increasing their physical strength. Tae-Kwon-Do Karate is an intricate art of hand and foot fighting, an exciting sport and a vigorous method of maintaining physical fitness. Hapkido is the art of submission and evasion. You will learn to get out of holds and how to control the nerve center. Our expert instructor will guide each student through the program with care and understanding. Uniforms and protective equipment are available through the instructor. Uniforms are mandatory after the second week. Learn the basics of baton twirling in the beginner class and then work your way into the Razzle Dazzles baton teams and corps. All twirlers will be given an opportunity to march in local parades, perform in shows and attend competitions. Baton twirling develops coordination and confidence. 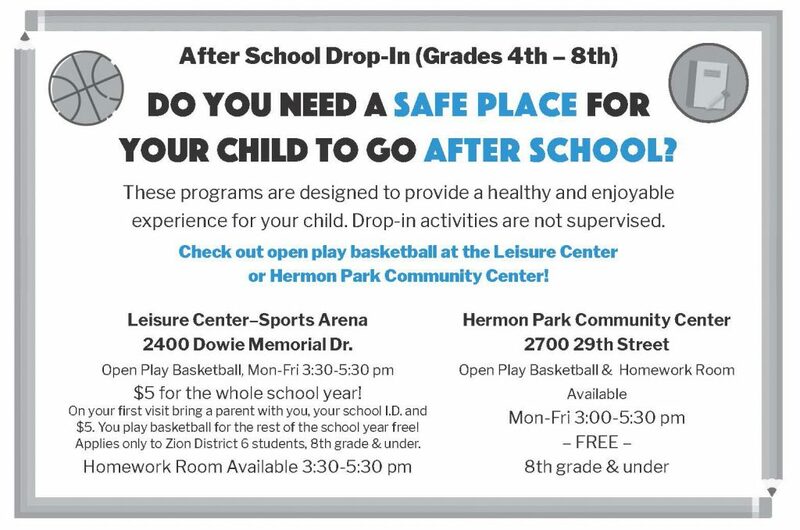 Zion Park District offers a wide variety of classes for each group and level. Children will be measured for a baton on the first day of class if needed. This camp is for beginner twirlers. It will include basic baton instruction, dance and pom. Equipment will be provided during camp (batons and poms). This camp is for those that are currently in the Razzle Dazzles program and will be attending Nationals Competition. Baton Festivals start at 9:00 am and will be held at Zion-Benton Township High School (21st Street and Kenosha Road). More than 200 twirlers of all ages and levels will compete in more than 80 categories. These contests are sanctioned by the National Baton Twirlers Association. The Hockey Academy focuses on developing the players skating and general hockey skills. This is a feeder program for the Patriots and Vipers Teams. Pre-Hockey Team programs are tailored to teach the skills needed to play hockey. Registration is always open sign up anytime! This class is for brand new skaters with no skating experience. Class focuses on balance, beginner stride, getting up and down without assistance, beginners edge-work, and entry level hockey skating skills. Helmet and hockey skates are required for this class. Rental equipment available on site. Hockey Learn to Skate or 20 hours of skating experience required. General introduction to skating with little focus on hockey skills. Full equipment is required for this class. Rental equipment available on site. Our Learn-to-Play hockey school is for kids who have some skating proficiency. Participants will be taught the basics of hockey. The hockey school staff will further break the class into skill based groups.Full equipment is required for this class. Rental equipment available on site. It’s soccer season and 5 Star Sports would love to spend it with you. This soccer program will cover all the basic skills of soccer; dribbling, passing, shooting and goal tending. Shin guards are optional. Go to www.ayso980.org for complete information. Boys and girls ages 3 to 17. Register online starting 5/1/2019 at www.AYSO980.org or attend the registration event on Saturday, June 22 from 10:00 am to 12:00 pm at the Zion Park District Leisure Center. Fees: $125 through June 30. After July 1 a $40 late fee applies.